Reading is taught in the early elementary years. Reading difficulties during the early years can arise from lack of fluency, limited vocabulary, or poor word recognition. Interventions are often designed to address these various components of reading. Going further, however, students also need to understand what they are reading. Students should be able to derive meaning from text. This is how reading becomes a vehicle for further learning. One might therefore ask whether students with reading difficulties can benefit from interventions that focus on reading comprehension. The answer, according to research, is "yes". ...during the second component, Read to Understand, students were taught the meaning of vocabulary words introduced during Word Works, as well as comprehension skills and strategies to apply while reading fiction and nonfiction. For example, lessons offered explicit instruction in previewing, setting purpose, text structure and evaluation, making inferences and taking perspectives, drawing conclusions, author’s purpose, sequencing, main idea, summarizing, independent reading fix-up strategies, teacher and reader questioning, and making connections within and across texts. Findings indicated the treatment significantly outperformed the comparison on reading comprehension (Effect Size = 0.38), but no overall group differences were noted on word reading or vocabulary. Students’ initial word reading scores moderated this effect. 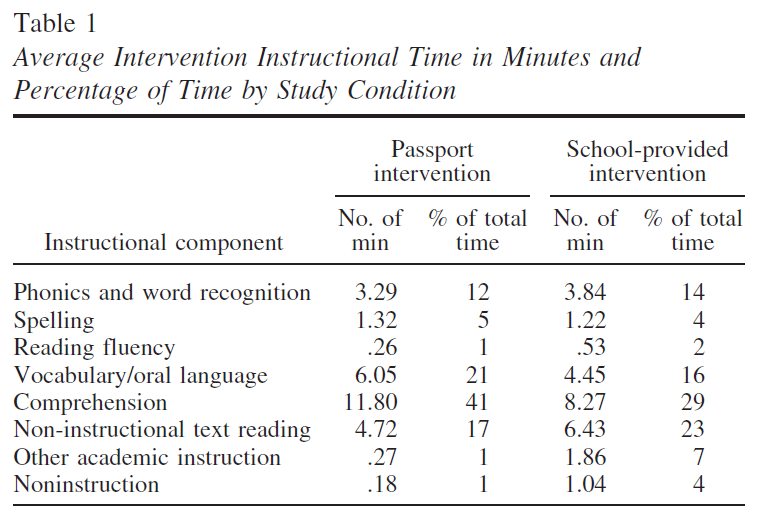 Reading comprehension effects were similar for English learner and non-English learner students. The study by Wanzek and coworkers focuses on struggling readers and indeed the authors include the following in what they think are some of the limitations of their study. We also recruited schools that were diverse and served students from low socioeconomic backgrounds, so our findings might not generalize to schools serving students from higher socioeconomic backgrounds. The majority of our ELs in our study were Hispanic and our findings may not generalize to students from other language backgrounds, particularly those with orthographies that are very different than English. Further, effect sizes are interpretable relative to the comparison condition in the participating schools where very few struggling readers received supplemental interventions as a part of their typical practice. Finally, whether these findings are transferable or not is obviously dependent on how well the intervention is implemented since explicit instruction is an essential part. In the study, trained research personnel (not classroom teachers) have provided the intervention.